The Sunday Times, on the 8th of January, 2009, under the byline of Rhys Blakely, ran an article on the Satyam/PwC fraud, which had cost investors US$ 2 Billion just the day before, in a single day of trading. "Furious Indian investors are demanding to know how PricewaterhouseCoopers (PwC), one of the world's largest accountancy firms, missed a systematic £1 billion fraud at Satyam, the IT outsourcing giant, for as long as seven years. In contrast, Merrill Lynch, the US bank, became aware of the deception in just ten days." Mr Paul Boorman, Global Leader - Operations, and Mr Coenie Van Beek, Global Leader for Ethics and Business Conduct, in PricewaterhouseCoopers, we ask you, how you could have missed the continuing fraud perpetrated by PwC in Malaysia, for the past 8 years? 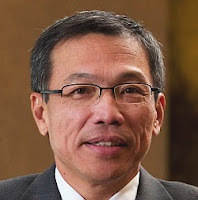 Are we to believe that fraud is not as serious an offence when it is done by the Country Managing Partner, Mr Chin Kwai Fatt and his cohorts, involving a company that still bears the name PricewaterhouseCoopers Consulting Sdn Bhd (464379-U)? The Asia Times has this to say on the Satyam/PwC scandal, " The local unit of PwC said in a statement that Satyam's accounts were supported by "appropriate audit evidence", according to Bloomberg. "Collusion" was a common term used by the accountant community. "My first reaction when I heard about the Satyam fraud was how had their auditors kept quiet about it," said Ramesh Kumar, an accountant with 19 years of experience in various companies. "Auditors not knowing about a fraud this size does not seem possible, particularly with the confession that Satyam has been doing it for years." Mr Paul Boorman and Dr Coenraad Van Beek, are the actions of the Country Managing Partner, Mr Chin Kwai Fatt, in appointing 'sham directors" also supported by sound auditing industry standards? Country Managing Partner for PwC, the MD, Mr Chin Kwai Fatt. The Economic Times has this to say on the fallout from the Satyam/Pwc fraud," It has been reliably learnt that PwC global CEO Samuel DiPiazza, Jr., along with some senior worldwide partners is currently in India to assess the situation, after widespread reports that Price Waterhouse’s alleged overlooking of Satyam accounts could impact the audit firm’s reputation and business in India. It is learnt that the global partners are actively considering restructuring the India unit. Although investigations into Price Waterhouse’s role in the Satyam saga have just started, the media glare on the firm has made senior partners uncomfortable and that is the reason a likely reshuffle of the top team is on the cards, said persons familiar with the development. A PwC spokesperson declined to comment on the issue." Mr Paul Boorman and Dr Coenraad Van Beek, can we take it that a practice like this, with PwC in Malaysia using a tainted auditing firm for its own company, led by Chin Kwai Fatt & Co, is not enough to make the senior partners uncomfortable? The Financial Chronicle, in mydigitalfc.com, has this to say on the debacle,"The Satyam scam puts a big question mark on the role of its auditor, PricewaterhouseCoopers (PwC), which is supposed to be the statutory minder of the infotech company’s accounting practices and books. The specific question that it has to answer is: how did it let pass an accounts fudge of such a magnitude? Did it have a hand in it, or just turned a blind eye to the goings on in Satyam, or was simply incompetent to cotton on to the fudge? Mr Paul Boorman and Dr Coenraad Van Beek, please believe us that we have further irrefutable evidence of fraud being perpetrated by the Country Managing Partner, Mr Chin Kwai Fatt & Co, and that we will not turn a blind eye, nor be too incompetent to cotton on to the fudge.